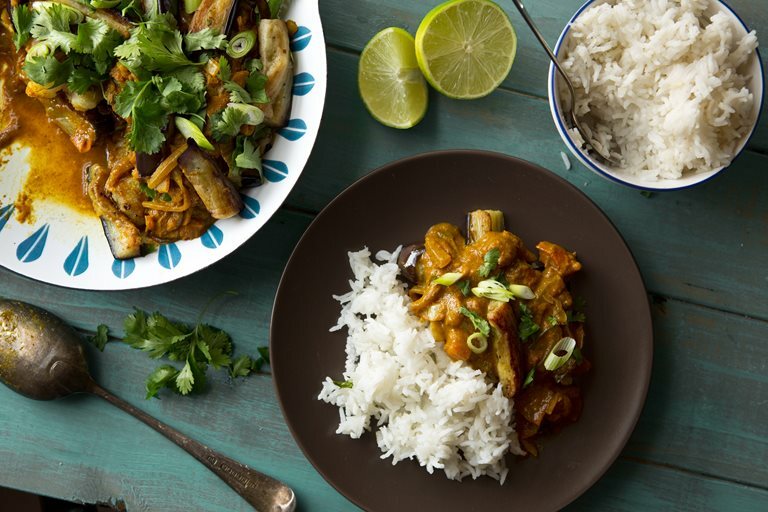 Selina shares how to make Cari Poisson, fish and aubergine curry - a beautiful and easy to prepare curry that’s highly popular in Mauritius. People always ask me: 'what is Mauritian food like? Are the curries similar to Indian style curries?' Well, yes. They have their similarities and differences, like those from different regions. Mauritian curries are fragrant, light dishes using thyme and fresh coriander, as well as heady spices of cinnamon, coriander, cumin and turmeric. This recipe is shared during many family dinners in Mauritius, the traditional fish and aubergine curry or Cari Poisson, as it is called. In true fashion it is eaten with chutneys, salad, faratas or rice and pickles. The fish must be fresh. Steaks or fillets work well, but use white fish to achieve best results. I never used to enjoy eating fish curries when I was younger, but since cooking local dishes from my Mauritian heritage this is slowly scaling up on the list of favourites from the Island. It tastes approximately 30 - 45 to make from start to finish, feeding 4 people, and is well worth the effort! 3 tbsp of curry powder, Mauritian or mild. Mauritian curry powder is available in specialist shops. Turn off the flame and transfer to a serving dish. Garnish with coriander leaves and spring onions and serve with basmati rice, faratas and pickles or chutneys the Mauritian way! Selina Periampillai is a British-born Mauritian food pioneer, self-taught chef and food blogger.